Born Jun 14 18721,3,11,12 [Jun - 18732,4,5], Berkley, Ballard (now Carlisle) County, Kentucky1,3,11,12. 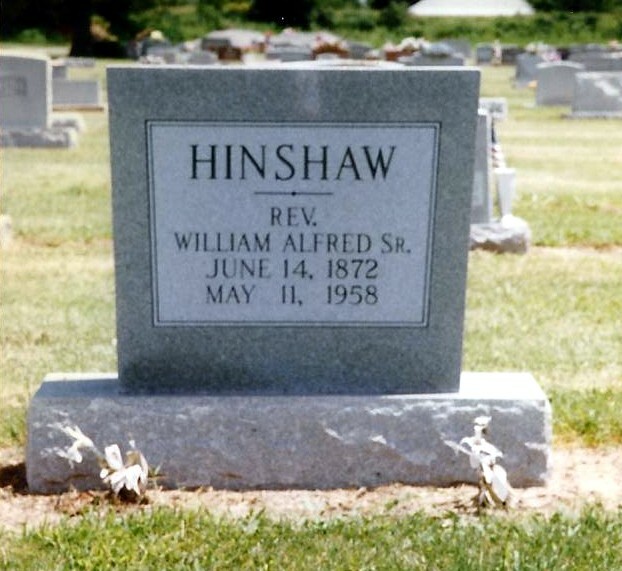 Hinshaw, William A., head-of-household, age 26, born June 1873 in Missouri; parents born in Kentucky; married 7 years; [..occupation unclear..]; rented home. Hinshaw, Katie F., wife, age 26, born Nov 1873 in Kentucky; parents born in Kentucky; married 7 years; 3 children, 2 living. 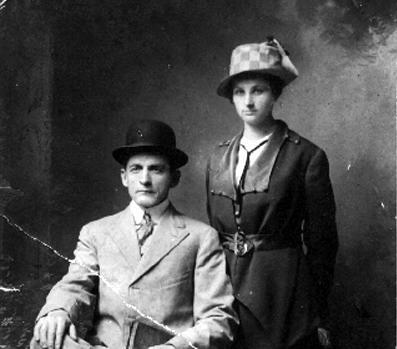 Hinshaw, Millie, daughter, age 4, born May 1896 in Kentucky; father born in Missouri; mother born in Kentucky. 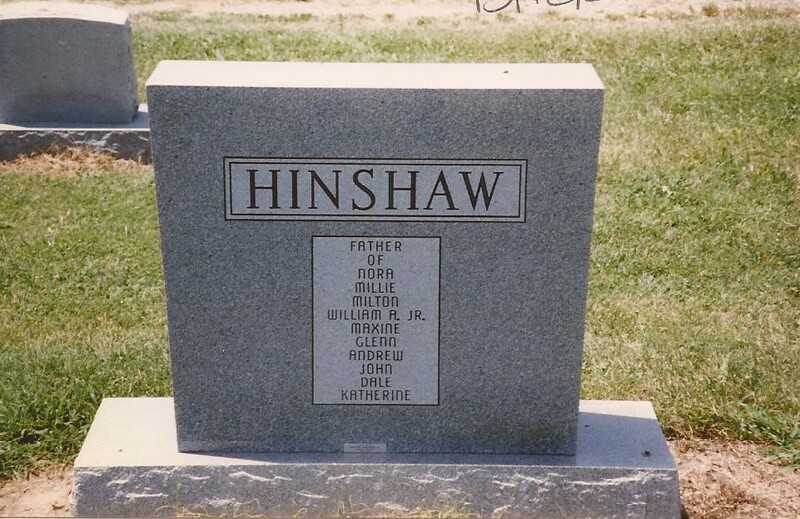 Hinshaw, Milton, son, age 1, born Aug 1898 in Kentucky; father born in Missouri; mother born in Kentucky. He then married Lucy A. Grace1,11 [Lucy A. Campbell1, Rosa A. Grace3], Dec 16 19011,11. Lucy, daughter of Judge James D. + Lucretia Grace, was born about 1869, Missouri.3,11 No children by this second marriage. Henshaw, William A., head-of-household, age 37, born in Kentucky; father born in Kentucky; mother born in Tennessee; second marriage, married 9 years; occupation: farmer, general farm. Henshaw, Rosa A., wife, age 41, born in Missouri; parents born in Kentucky; second marriage, married 9 years; 3 children, 3 living. Henshaw, Millie, daughter, age 14, born in Kentucky; parents born in Kentucky; attended school. Henshaw, Milton, son, age 11, born in Kentucky; parents born in Kentucky; attended school. Campbell, Rosa, stepdaughter, age 21, born in Missouri; father born in Virginia; mother born in Missouri; attended school. Campbell, James, stepson, age 18, born in Missouri; father born in Virginia; mother born in Missouri; occupation: farm laborer, home farm; attended school. Campbell, Tom, stepson, age 16, born in Missouri; father born in Virginia; mother born in Missouri; occupation: farm laborer, home farm; attended school. Grace, Lou, mother-in-law, age 66, born in Kentucky; parents born in Kentucky; widow. Coshton, John, boarder, age 68, born in Missouri; father born in U.S.; mother born in Kentucky; widower; occupation: farm laborer, working out. Henshaw, Wm, head-of-household, age 46, born in Kentucky; parents born in Kentucky; rented home; occupation: minister, protestant. Henshaw, Eileen, wife, age 25, born in Kentucky; parents born in Kentucky. Henshaw, Wm A Jr., son, age 3, born in Illinois; parents born in Kentucky. Henshaw, Geneva, daughter, age 1, born in Missouri; parents born in Kentucky. Hinshaw, William A., head-of-household, age 56, born in Kentucky; parents born in Kentucky; first married at age 41; rented home ($30 rent); no radio in home; occupation: general repair, auto factory; not a veteran. Hinshaw, Ilene M., wife, age 35, born in Kentucky; parents born in Kentucky; first married at age 21. Hinshaw, William A, son, age 13, born in Illinois; parents born in Kentucky; attended school. Hinshaw, Geneva M., daughter, age 11, born in Missouri; parents born in Kentucky; attended school. Hinshaw, Hyland, son, age 8, born in Missouri; parents born in Kentucky; attended school. Hinshaw, Andrew J., son, age 6, born in Missouri; parents born in Kentucky; attended school. Hinshaw, John W., son, age 3, born in Michigan; parents born in Kentucky. Hinshaw, Dale K., son, age 1, born in Michigan; parents born in Kentucky. Hinshaw, Juanita K., daughter, age 1 month, born in Michigan; parents born in Kentucky. 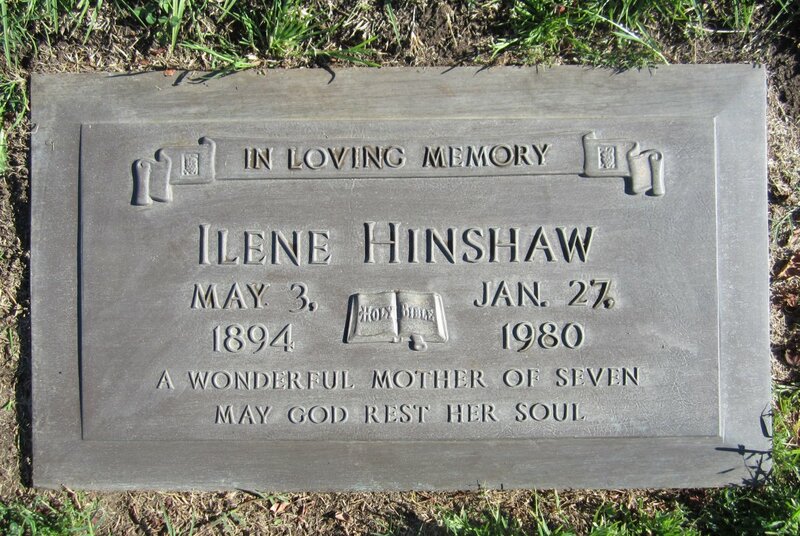 Hinshaw, Ilene, head-of-household, age 45, born in Kentucky; completed 1 year of high school; on Apr 1 1935 was living in the same city; divorced; rented home ($30/month rent). Hinshaw, Maxine, daughter, age 21, born in Missouri; completed 4 years of high school; on Apr 1 1935 was living in the same city; divorced; occupation: auto underwriter, insurance; worked 50 weeks in 1939; $900 wages in 1939. Hinshaw, Glen, son, age 18, born in Missouri; completed 2 years of high school; on Apr 1 1935 was living in the same city; attended school. Hinshaw, Andrew, son, age 16, born in Missouri; completed 2 years of high school; on Apr 1 1935 was living in the same city; attended school. Hinshaw, John, son, age 13, born in Michigan; completed 8th grade; on Apr 1 1935 was living in the same city; attended school. 1900 census, St. James Township, Mississippi County, Missouri; roll T623-875, ED 68, page 14A, line #20, dwelling #266, family #266. 1910 census, 3rd District, Fulton County, Kentucky; roll T624-477, ED 61, page 86A, line #8, dwelling #158, family #158. 1920 census, Liberty Township, Stoddard County, Missouri; roll T625-964, ED 211, page 12A, line #33, dwelling #277, family #282. 1940 census, Los Angeles, Los Angeles County, California; roll T627-418, ED 60-853, page 12B, line #79, household #457. 1920 census, Liberty Township, Stoddard County, Missouri; roll T625-964, ED 211, page 12A, line #23, dwelling #277, family #282.